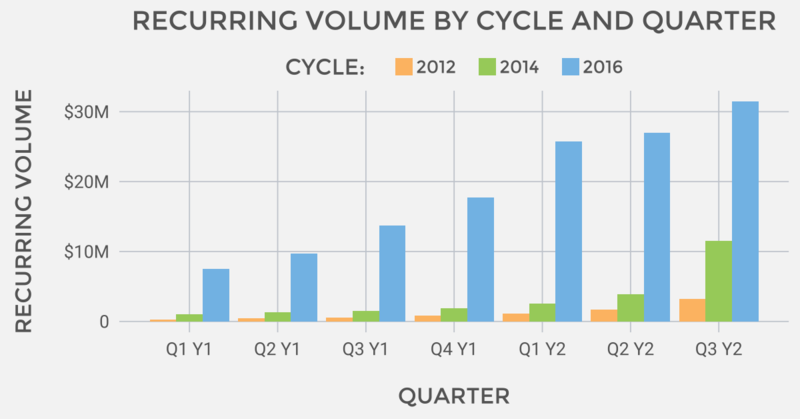 Our 2015 report is here! We just launched our 2015 report. It has all the graphs and (moving!) 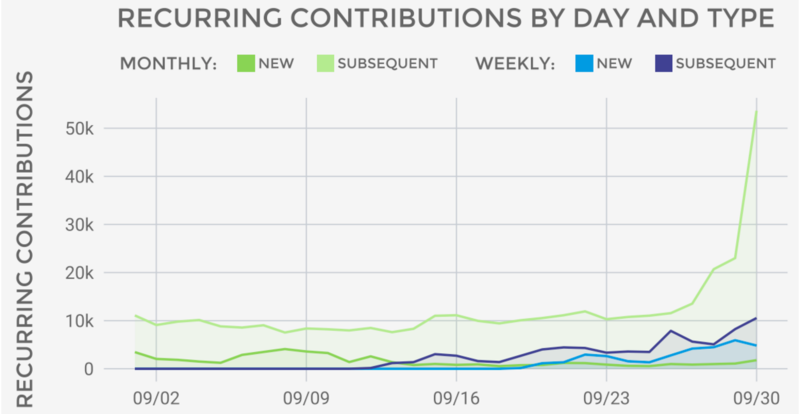 charts you could want, plus insights into the world of small-dollar fundraising. 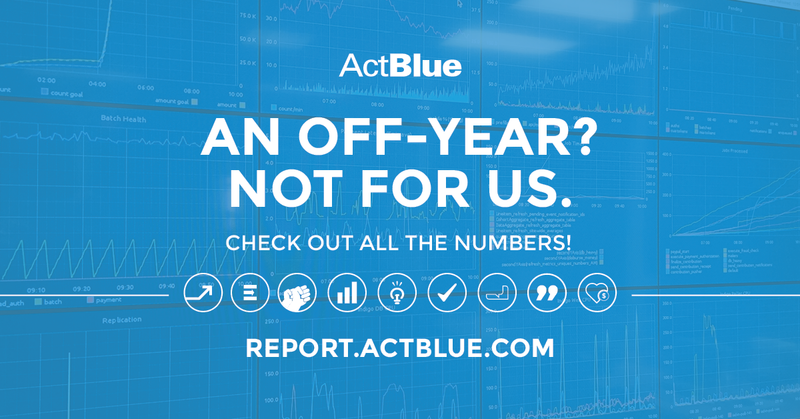 At ActBlue, we have an amazing group of supporters who chip in to help us build our tools, plus a great community of campaigns and organizations putting our tools to the test with their fundraising prowess, so we wanted to take the time to thank every one of those people and report back on our work in 2015. Oh, and big things are coming in 2016! Last month the FEC ruled 6-0 to approve our request to open up restrictions on draft funds for federal candidates. Yes, it’s incredibly nerdy, but it’s a big deal. Democratic digital fundraiser ActBlue won a unanimous green light from the Federal Election Commission today allowing the firm to start raising money for the Democratic 2016 presidential nominee — only if that person is a woman. Hillary Clinton or any other female Democrat who secures the top spot on the 2016 ticket would benefit from ActBlue’s efforts. The company had previously secured FEC approval to establish “draft” campaigns before a formal candidate had declared their intention of running for an office. With its latest request, ActBlue got specific permission to establish a fund for which gender was the primary reason for someone to donate cash. Yep, ActBlue can now set up a nominee fund and raise a pot of money that goes to the nominee if she is a woman. She’d get it when she officially became the nominee. Additionally, you can now set deadlines for candidates to declare. If they haven’t announced their candidacy by then, the money goes elsewhere. It’s a way of building urgency around draft campaigns and getting your issues injected into the debate. But if none of the potential recipients declare in time, then the DNC receives the funds. The primary reason we asked the FEC to rule on these requests is so that millions of small-dollar donors can encourage candidates — especially women — to run for federal office, in particular the presidency. And that’s something the FEC commissioners are interested in themselves. ActBlue is always innovating to find new ways to give small donors a voice and help the organizations that use us advance their agendas and meet their goals. This new freedom from the FEC will help us do just that. 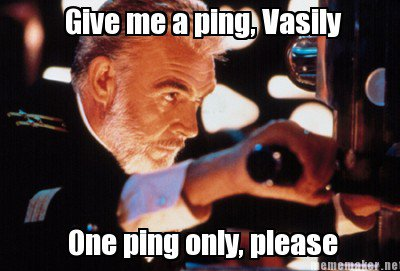 Introducing the greatest ActBlue feature ever: the ping. 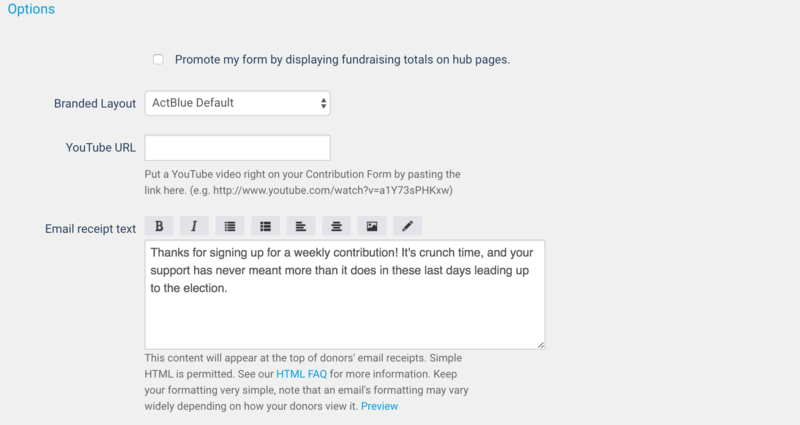 Sometimes you want to know every single time you get a contribution, right? I mean, you need more notifications in your life. Now it’s possible. 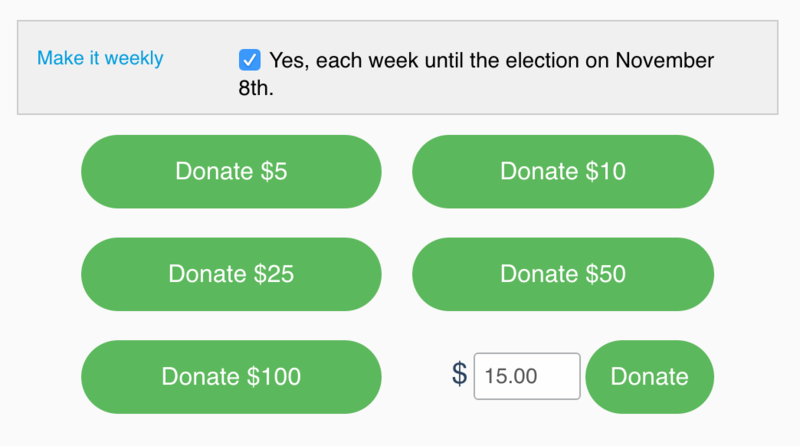 Visit your campaign or organization’s Metrics page and scroll to the bottom where you’ll see an option to “Play a sound when you get a contribution!” Use the drop-down menu to test out sounds and make your selection. Sounds include chaching, ice rink, coin, and more! Happy Friday everyone. 24 days to go! Have a suggestion of a sound you’d like us to add? Let us know at info@actblue.com. It’s crunch time so optimize those weekly recurring asks! We’re fewer than six weeks from the election. That means, among other things, that optimal fundraising strategies become even more important than usual. Here at ActBlue, we’ve been running tests on a nearly daily basis on all kinds of Express Lane strategies. Typically, we see the largest (statistically significant) improvements when optimizing factors related to the Express Lane askblock structure like amounts, number of links, and intervals between the links. For our own list, we find that, statistically speaking, the flashier aspects you see in some fundraising emails — emojis in subject lines, e.g. — do not do much (if anything) to improve donation outcomes. Here’s a tactic we recently tested, though, that’s a bit more on the fun side of things and definitely brought in a lot more money. So what happened? The segment with the ‘7 for 7’ ask performed much better than the control; it brought in 87.6% more money, a statistically and practically significant improvement.3 Cool! What’ll be interesting to me is to see when this tactic will lose its optimality. The key factor is that $7 (with gimmick) performed better than $10 (the control and previously optimal ask amount) despite it being a lower dollar amount. Though, at some point, a too-low number-of-weeks-to-election-dollar-ask-amount combination will negate the positive c.p. effect of the gimmick. Based on other testing we’ve done, my guess is that that will be at 4-weeks-$4. We’re doing follow-up testing on this “n weeks until the election!” tactic, so we’ll see! If you decide to test something similar, send me an email and we can chat! Emails to info [at] actblue [dot] com with my name in the subject line will be directed to me. P.S. Doing a lot of testing in the election run-up? Want a tool to help you manage your test groups? I wrote something in R for you! I’ll post something on the blog about it soon, but if you want it in the meantime, shoot me a note (emails to info [at] actblue [dot] com with my name in the subject line will be directed to me). 1 Actually, we built a model that predicts how a given Express user will respond to different types of donation requests based on previous donation information. Using those predicted values, we decide what type of donation ask they receive (of one-time, weekly recurring, monthly recurring) and for how much money they are asked. Math! The point: this is what we landed on for a certain subset of our list. 2 Of course, all else equal, it’s tough to distinguish whether any difference was due to the gimmick or because $7 is lower than $10. The theory would be that with a lower amount, more people would give, and even though the mean donation amount would likely be lower, the increase in number of donors would outweigh the decrease in mean donation size. This is definitely possible, but so is the opposite; it’s all about finding the optimal point. In fact, we included a segment in the test which received an askblock starting with a lower amount and saw this dynamic in action, though the overall treatment effect was not statistically significantly different from the control. This lends support for interpreting the effect from the gimmick segment as the gimmick per se, but a detailed discussion is excluded from the body of the post for the sake of brevity. More rigorous follow-up testing on this “n weeks until the election!” tactic is already in the field— shoot us an email to chat! 3Pr(>|t|) < .01, controlling for other significant factors, including previous donation history. At ActBlue, we’re constantly working to improve our technology in ways that will help us further our mission so that we can share those improvements with you! But it’s not always a steady march towards progress. As anyone with compliance experience knows, campaign finance regulations aren’t always up to date with emerging technology and that’s when we have to get creative. We recently encountered a clear example of this tension in our home state of Massachusetts. The Massachusetts Office of Campaign and Political Finance (“OCPF”) is responsible for promulgating, overseeing, and enforcing campaign finance regulations within the state. We wanted to roll out Express Lane, our single click donation system, in Massachusetts, but one OCPF regulation in particular gave us pause. 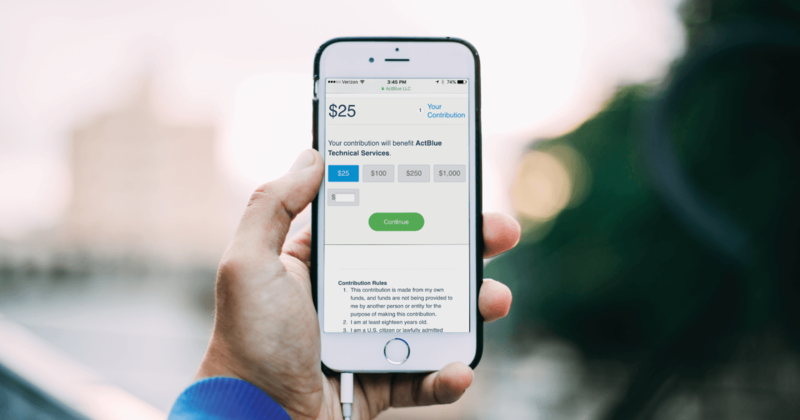 This regulation applies to contributions made with a credit or debit card over the internet and it requires that the contributor click a checkbox on the contribution form to confirm they meet certain requirements prior to their final act of clicking the “donate” button. Given that the whole purpose of Express Lane is to just click once in an email in order to contribute, the regulation meant that we couldn’t use Express Lane in Massachusetts. Luckily the OCPF shares our commitment to making it possible for more grassroots supporters to get involved in politics. The department invited our legal staff for a sit-down at their office to discuss the advisory opinion request. The staff expressed its interest in finding a way for Express Lane to help spur contributor and voter engagement in Massachusetts and agreed that requiring some changes to Express Lane could be counterproductive if they resulted in inhibiting contributions. That’s the ideal situation when we work with regulatory agencies. We always want to play by the rules, but we also appreciate working with regulators who want to ensure that the rules encourage small donors to participate in the democratic process. Ultimately, the OCPF determined that adding specific language in Express Lane emails could allow contributors to simultaneously donate and certify that they meet the requirements, as opposed to requiring two separate actions. Because the OCPF was willing to work with us as we made changes to our tools to ensure Massachusetts candidates and committees could use Express Lane with ease, we’re proud to say ActBlue Express Lane is now active in Massachusetts, along with thirty-two other states! We’re looking forward to working with more regulators to solve the challenge of keeping campaign finance regulations up to date with technology. Want to use Express Lane in Massachusetts? Just drop us a line at info at actblue dot com. In November, New York City mayor Michael Bloomberg will be term-limited out of office, and will no longer hold the title of “Hizzoner.” For the first time in 12 years, the mayoralty will once again be up for grabs, along with at least 22 city council seats, and 4 out of 5 borough presidencies. That’s why we’re excited to announce that after months of work with our partner, the New York City Campaign Finance Board, we are offering our fundraising tools to the city’s municipal candidates–from the mayoral candidates on down–including those who will receive public matching funds. 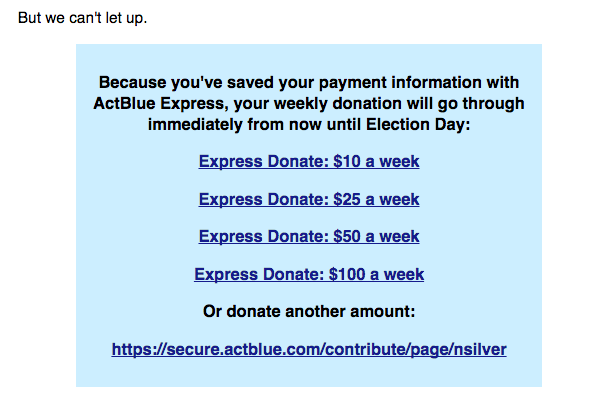 Here at ActBlue, we’ve always been about making your voice heard, helping you pool the resources of your supporters to increase your impact, and making sure that no donation, no candidate, no vision is too small. The Board is proactive when it comes to regulating money in politics, and their efforts have created one of the country’s best public financing systems. Naturally, the system comes with strict regulations, especially for credit cards processed online. 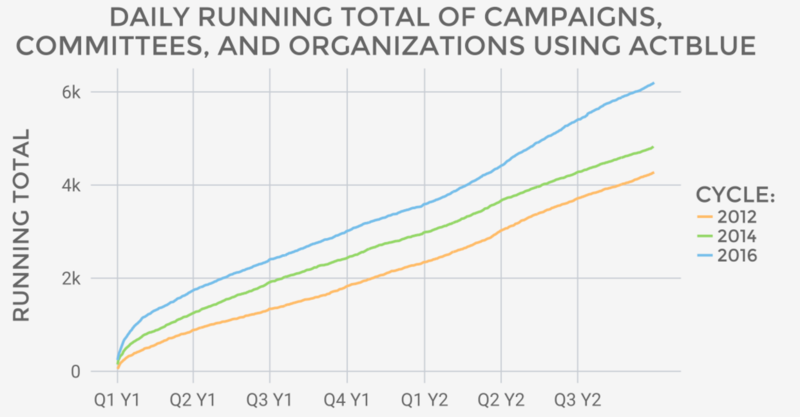 This means that smaller campaigns don’t always have the opportunity to fundraise online because of time constraints and prohibitive costs–which translates into lost opportunities and fewer connections with supporters. 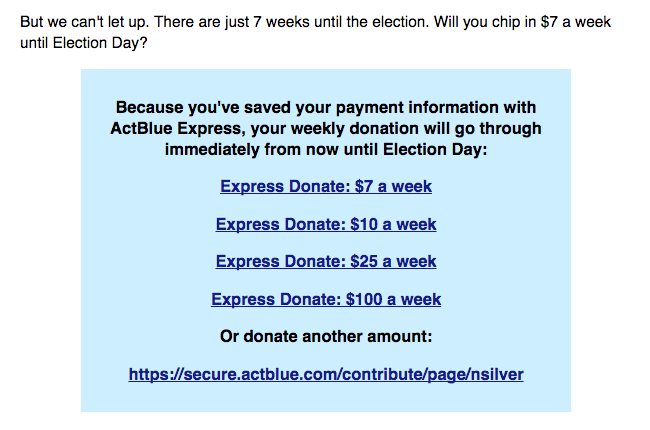 However, since ActBlue shifts much of the resulting burden of compliance and legal work from local campaigns to our staff, even the smallest NYC campaign can now raise money online using our tools. When candidates sign up for ActBlue, they’re also getting a chance to tap into our community of 500,000 registered ActBlue Express users. They are our most dedicated donors, who make most of their political contributions through ActBlue and convert at a significantly higher rate due to our one-click donation process. This gives candidates a higher return on their fundraising initiatives, making the program a great resource for our campaigns. We’re excited to share it with NYC candidates so they can benefit as well. 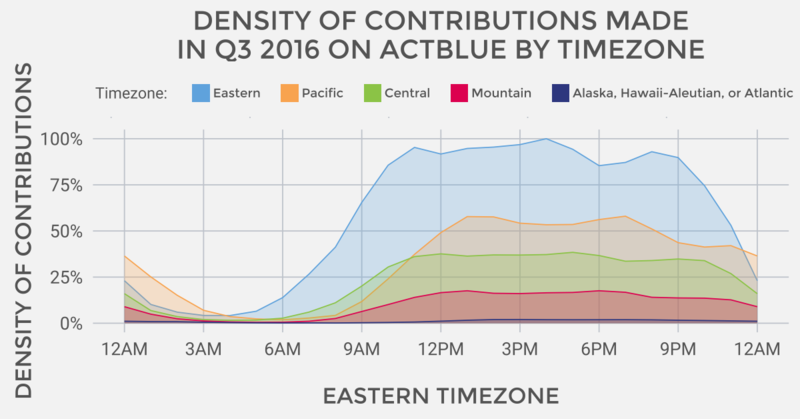 Most of the money raised through ActBlue comes in the form of small dollar donations – $50.27 was the average donation during the last election cycle. That’s important for New York City, where candidates can receive matching funds of up to $6 per dollar donated on contributions under $175. ActBlue was built specifically for grassroots fundraising, and we couldn’t pass on a chance to team up with a city that supports our vision. We hope you’ll take a look around the site, search for your favorite New York City candidates, spread the word or sign up here. No campaign is too small–or too big–to start putting power in the hands of supporters. As a follow-on to my previous post, I'd like to emphasize that groups like American Action Network and Crossroads GPS are not infrastructure in the ActBlue sense. These groups are a means for very wealthy individuals–upon whom AAN and GPS depend to survive–to influence our electoral process through large undisclosed donations. Those donations aren't popular among the electorate, and the organizations themselves exist largely as a result of the Citizens United decision and the disarray of the RNC under Chairman Steele. It's a winning combination of dependence, insecurity and loathing: dependent on a small number people, founded in shifting legal ground, and widely loathed by the American people. ActBlue is rooted in the least controversial aspect of campaign finance law: the ability of actual (not corporate) persons to give to campaigns. The sort of giving our platform enables is tremendously important to a community of donors over a million strong, and is exactly the sort of credential candidates like to burnish.